Fast Wireless Charging For BMW? Are BMW’s electric vehicle (EV) offerings going to be set up for wireless charging in only the next few years? An interesting question — it certainly does seem that the technology is developing at a fairly rapid rate, so maybe widespread use is something that we can expect soon. What about a 22 kilowatt (kW) charger that can completely recharge a BMW i8’s battery in just 15 minutes? Got your interest yet? Graeme Davison, Qualcomm’s Vice President of technology, told evo that the system is essentially production-ready, and that the company is working with several manufacturers to introduce the technology into their model line-ups. There’s even scope for a more powerful 22kW charger to be fitted to the next Formula E safety car — Qualcomm says a 22kW charger could fill an i8’s empty battery in as little 15 minutes, and perhaps more impressively, it could even fill the much larger battery of the all-electric i3 in less than an hour. There’s even talk of charging on the move — wireless platforms that could be integrated into Formula E street track surfaces that charge the car as it travels along at high speed. 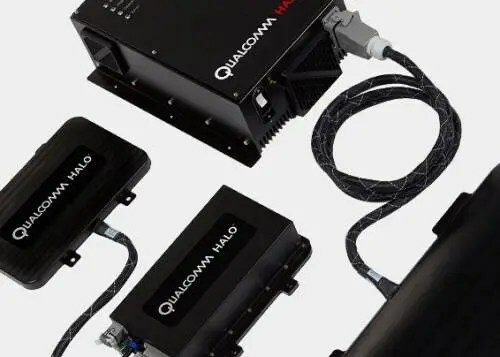 Qualcomm is reportedly experimenting with this technology, but unsurprisingly, it’s still some way off being able to charge cars at full race pace. Nevertheless, it previews a future of wireless charging technology that could work on the road. I am curious (and have no idea, thus this post), even with a ~20% efficiency loss, would it still be ‘better’ than ICE? What I am getting at is if wireless charging somehow did manage to captivate people into electric cars in significant numbers, would the cars still be better for the environment (given 20% waste of electricity), and would they still be economical (compared to filling up with gas, assuming the car owner ends up paying for all electricity)? For my question, I’m fine ignoring all other factors (of which I am sure there are many, infrastructure costs, maybe environmental factors (snow on the roads?)). Interesting speculation. One could see such a setup in use in certain areas or situations, but to my mind, probably not in any widespread context. Home charging with a plug is convenient enough, and more efficient/cheaper.